So I'm guessing the park's 5-star chef was able to whip up this feast before the entire island's staff was evacuated due to the approaching hurricane (already stretching it). Which means that by the time Lex and Tim sit down to breakfast the following day, this food had been sitting out at least 12 hours...in a non-air conditioned room...ON A TROPICAL ISLAND. 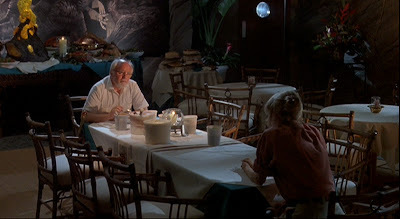 After all Hammond and Ellie were eating all the ice cream because it began melting once the power went out. 1.) How did that food even look, smell and taste appetizing under those conditions and with no flies buzzing nearby? 2.) 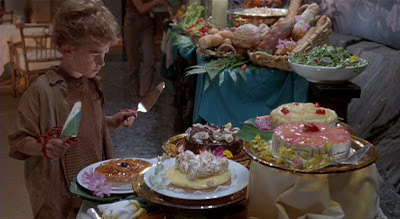 How did the kids NOT get hit with food poisoning before the raptors attacked in the next scene? These are the kinds of questions that need to be asked and answered. Huzzah to you! I have no answer, of course. Don't ask me, I didn't even like that movie. The dinosaurs were SO much smarter than the people! Yeah, if dinosaurs are so smart, how did they become extinct in the first place? And why hasn't the human race become extinct yet? This is perhaps why the kids are not in Jurassic Park II. Their memories of the horrors of that island are not of the dinosaurs - it's from the stomach cramps and food poisoning from the buffet of the damned. Fantastic! I'd certainly believe it. Especially looking at all those creamy desserts. Both kids probably had to be tube fed afterwards. The answer's pretty obvious...not that I could tell you what it is. Well, when you do find out please let me know so I can sleep at night. I've been having nightmares about that buffet table of old food for weeks. I LOVE THIS TOPIC!!! You described what you were doing with this feature, but as usual you are so much more creative than I can hope to be. Gotta start thinking of my own contribution to this. LOVE IT. Actually this evolved out of what I told you last week. I was initially going to highlight plot holes (the food magically appearing), but when I realized the food was indeed prepared the day before, my focus shifted. Can't wait to see what questions you pose! It's all a dream inside Goldbloom's head! That would explain why he's the star of the second one! Next, explain why the airship in The Avengers turns invisible...because they do that and then seem to forget they did that. It's not referenced as cloaked, people find it, and we never saw it decloak. It's been driving me crazy! Joss, WTF? Excellent point, P! I didn't even think about that when I saw it. I did an eyeroll when the "cloaking shields" (or whatever they called it) went up. Apparently it was a pretty useless feature on the ship. Ha ha! Judging by the junk food on his desk, he didn't too either.